Here are a few sample thank-you letters that an employer can write to an employee to recognize the employee's good work. These are informal employee recognition letter samples. The informal employee recognition letter can be written in minutes. Keep in mind that an employee recognition letter is also appropriate from coworkers, employees in different departments, managers, supervisors, and executives, as well as from the employee's boss. 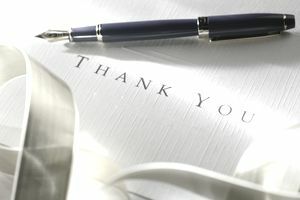 Coworkers are more likely to use the semi-formal or the informal style of employee recognition letter, as opposed to a more formal letter from a boss or supervisor. Don't hesitate to thank and recognize your coworkers for their efforts. Just as ​a ​manager can boost morale by praising their employees' successes, individual contributors can boost morale by being kind to their coworkers and praising their successes as well. You need help to get your job done correctly and if your coworkers know how much you appreciate them, they'll be more likely to help you in the future. Should you copy your coworker's boss on these informal notes that are written to a coworker? Sometimes, though maybe not for a “thanks for your help today” note. In the following samples that mention specific accomplishments and tasks, however, letting your coworker's boss know can really make your coworker's day. I want you to know how much we appreciate the extra time you put in this week to get the new product orders shipped. The customers were well-served by your extra efforts and the company appears customer-oriented because we delivered on our promised timeline. It was such a great surprise today when I came in and found out that you'd taken care of running the month-end reports while I was out sick yesterday. I was stressed out, thinking about how I would possibly get these done today, and was relieved to see that you did them. Talk about a great boost to my day! Thank you again. It's great to know that you have my back when I'm sick. If I can ever do anything to help you out, please let me know. Your presentation today was awesome. I think you totally nailed it and even though the clients were pretty silent, I could see by the looks on their faces that they were impressed. I'm pretty sure we'll close this deal because of your hard work today. I wanted to thank you for the training session last week. I was dreading going through training for the new HR system. In the past, all technical training has been so dry and boring that I could barely keep my eyes open. To my surprise, your class was not only informative but fascinating. I feel like I really got the information I need to be able to do my job. Now that I've been using the new system for a week, I'm laughing at why I was so freaked out about the change. Your class really made the transition smooth. As you can see, it doesn't have to be a long letter or filled with technical terms. Just ask yourself, “would I like to receive a thank-you note if I had done that?” If the answer is yes, then go ahead and take a couple of minutes to write an email. Your coworkers will appreciate your thoughtfulness. If you start doing this, you may find yourself receiving this type of note as well. If you have a particularly obnoxious or annoying coworker, praising them when they do something good can start to train them to focus more on the positive things and less on the negative things. You can affect change in this way. If you do receive a note such as this, make sure that you save it. When you're writing your self-evaluation each year, you can refer to these notes and make sure your boss knows about the impact you have had on your organization.